The Jenday Conure is probably the best known of the Aratinga conures, as well as being one of the most popular and commonly kept! The Jenday Conure is quite striking with its beautiful colors. 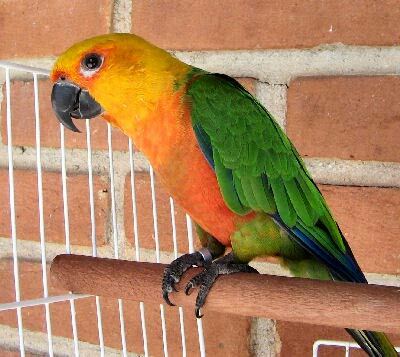 They are closely related to the Sun Conure Aratinga solstitialis and the Golden-capped Conure Aratinga auricapilla. Sometimes there is confusion between the Jenday Conure and the Sun Conure but you can easily identify the Jenday by its green wings and back, while the Sun has mostly yellow wings. A super sweet bird, the attractive Jenday Conure is very sociable and makes a very tame and loveable companion. They love to "talk", and yes, they are rather noisy little creatures. Being very active, they enjoy playing with toys, climbing, and chewing. Their antics can be very comical and at the same time they are very affectionate. If you are looking for a beautiful conure, the Jenday Conure will certainly capture your attention. It is also much less costly than the Golden Conure or the Queen of Bavaria Conure, two conures which are often touted for their beauty. These birds are native to northeastern Brazil. The Jenday Conure is a small member of the parrot family, and is very colorful. The head and upper breast are a golden yellow that blends into a reddish gold on the lower abdomen. Sometimes they will have an olive yellow breast. The wings, upper tail, and upper back are green moving into an orangish red on the lower back. The underside of the tail is black and the under side of the wings are an orangish red. The tip of the tail and the outer wing feathers are blue. The beak and the feet are black. 5 ozs for the female (125g -142 g). They live in pairs or small groups of 10 to 15 birds. They love to play, and can be fairly destructive if not watched. They can also be rather noisy. Despite all this, they make a real fun pet and are very popular. "Hi , this is Roxy, on my daughter Caley's shoulder! "....Dave"
They breed readily if they have the right size aviary. Though these birds will need to be either DNA or surgically sexed for a certain determination, the iris of the female is light brown and they have a grayish white eye ring while the male's iris is darker and his eye ring is pure white. The hen lays three to four eggs which are incubated for about 26 days. Both parents will feed the young. The young fledge (leave the nest) after about two months. The ideal nest box size should be 21 1/2" x 10" x 11" (55x25x28 cm), with a 2 3/4" opening (7 cm) which the parents will chew on and alter it to their liking. There has been a hybrid conure produced by crossing a Jenday Conure with a Nanday Conure. Looking for a Jenday/Jandaya conure. I currently own a green cheek and would love an addition to the family. Hello Kaitlin, are you still looking for a jendaye parrot, we have one for sale. male, sexed with papers, just under 2 years £200.00 please contact us for a photo, yellow and orange head. Just read some comments. I want to add a few more observations. Our bird does seem to be selective with people, likes some and not others. In the evening he gets a little more aggressive, kind of like a small child when he gets tired it think. Juanito begs when we eat, but I have noticed that even though he can digest the food, I think we should not give him human food like bread, even though he loves it. noticed that sometimes he gets more aggressive after eating bread. Maybe its the sugar in our food, don't know. He also likes to eat one little weed in our yard. This bird is weird. And he loves to look a penguins on TV. We have a Jenday. What a character. The bird is very intelligent. We first taught him to turn in circles to get a treat, but now HE has expanded it to mean 'I want' anything. He has become aggressive to some family members and after a while we noticed that it happens sometimes when his favorite person enters the room. He likes me, but will let my daughter handle him, until i walk in then he will attack her. Strange. But that does not mean he will not attack everyone, me included. We cannot carry mops, combs, toothbrushes, water bottles, or water drinking glasses around him, though cups are okay. One day when he attacked me I treated him harshly by striking him on the beak with my finger saying loudly 'No! No! No!' and so he learned the word no. He has learned several words: bed and outside are two others. Several days after punishing him for attacking me i said to him 'time to go to bed, bed, bed.' and he responded, 'no'! Amazing. Our bird flys and we leave him outside on the patio during the day, which is open to the back yard. He never leaves the yard however. In fact he will fly along the fence lines and return to his cage. There are hawks in the neighborhood and they are a danger. I have noticed however, that Juanito is a very fast and acrobatic flyer. He has outrun a hawk twice, but they do scare him. Once he flew into a bush in the neighbor's yard to escape and would not come back until I called him. And when he did he sat on my finger and squawked and squawked and squawked as if he was trying to tell me his problem. We have a vegetable garden, and Juanito likes to go to the garden, but only when someone else goes. then he will sit on top of a trellis and pren. Like a baby he likes to be talked to so I talk to him a lot. Also the little guy loves to play a game with me. I call it bang beak. If i drum my fingers on a surface, he will mimic me with his beak and has even come up with interesting combinations. a very smart little guy who has a huge personality, holds grudges, has an excellent memory and loves to play. I love conures, need to purchase one. I live in Ontario Canada. can you send me relevant info 'how to acquire a bird of this type. Need a jenday conure urgent.